Germany is home to high culture, fine art, classical music, world-class sports, award-winning cuisine--and some of the world's best beers. It's also one of the major economic and political powers on the European continent. A founding member of the European Union, Germany is a federation of 16 states, each boasting its own culture, art, cuisine, and regional traditions. Known worldwide for its precision engineering and high-tech products, the country appeals to tourists with its old-world charm and what the locals call "gemutlichkeit" (coziness). This is one of the easiest countries in the world to explore, offering an abundance of sightseeing opportunities. German transportation runs with characteristic German efficiency, which makes getting around the various regions easy, quick, and pleasant. Spend your holiday in Germany exploring urban museums, art galleries, modern restaurants, and trendy shops. You can also venture into the countryside to discover ancient castles and bustling little villages where the main tourist attraction remains the simple hospitality of the friendly locals. Bavaria: Germany's largest state, Bavaria offers visitors an abundance of medieval cities, dense forests, towering mountains, sparkling lakes, picturesque castles, and thriving villages. Baden-Wurttemberg: A hugely popular German vacation destination known for its multitude of mineral spas, Baden-Wurttemberg contains the famed Black Forest, featuring rugged peaks and well-maintained trails that draw adventurers from around the globe. North Rhine-Westphalia: The most populous of the German states, North Rhine-Westphalia is noted for its dense concentration of museums, art galleries, theaters, concert halls, and opera houses, spread across the region's busy metropolises. Rhineland-Palatinate: Filled with some of the most popular tourist attractions in Germany, Rhineland-Palatinate serves as home to six of the country's 13 wine-producing districts, leading the world in the production and export of outstanding sparkling wines. Hesse: Relatively small in size, Hesse is one of Germany's most prosperous regions, known for its outstanding public transportation, high quality of life, and lively nightlife. Saxony: Boasting a long history of independence as a separate kingdom, Saxony offers visitors a mix of medieval castles, cobblestone town squares, Gothic churches, lavish palaces, and old-fashioned steam trains. Lower Saxony: A growing number of tourists visiting Germany add Lower Saxony to their itinerary, attracted by the region's age-old culinary traditions, folk festivals, unusual local sports, and colorful costumes. Mecklenburg-West Pomerania: Offering nearly 2,000 km (1,200 mi) of coastline, Mecklenburg-West Pomerania calls itself Germany's "must-sea" destination, filled with seaside resorts, sandy beaches, and World Heritage-listed towns. Brandenburg: Once the heart of Prussia, sprawling Brandenburg includes three biosphere reserves and 11 protected nature parks, providing countless opportunities to explore some of Europe's largest natural attractions. 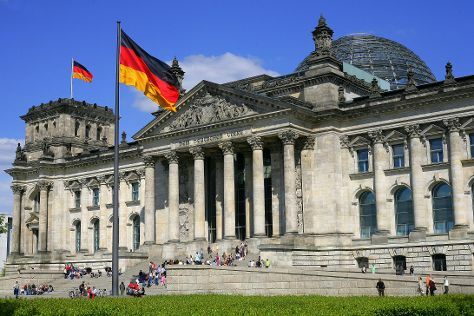 Berlin: Germany's capital and largest city, Berlin serves as Europe's symbol of unity and cosmopolitanism, offering tourists hundreds of cafes, clubs, bars, museums, galleries, shops, historical sites, and other fascinating places to visit. Munich: A major international business center, Munich remains at the heart of German tourism, drawing millions of annual visitors with its outstanding shopping and dining opportunities, as well as its world-famous beer festival. Frankfurt: Perhaps best known for its futuristic cityscape, Frankfurt boasts one of the world's busiest airports and a large network of intact 19th-century streets, squares, and public parks. Dresden: The favored home of many Saxon kings, Dresden has a compact historical quarter, filled with cultural attractions and architectural landmarks, all easily explored on foot. Nuremberg: Famous for its traditional gingerbread products, this vibrant urban center is home to some of the most popular places to visit in Germany, including award-winning museums, theaters, medieval churches, sporting venues, and art galleries. Hamburg: One of Europe's busiest ports, Hamburg remains Germany's gateway to the world, featuring lively waterfront neighborhoods known for their multicultural eateries and dynamic music scene. Trier: Founded long before the Roman era, Trier is one of the country's oldest cities, packed with historical monuments and architectural gems that have earned it a spot on the World Heritage list. Cologne: Once the capital city of a Roman province, Cologne serves as one of the most popular centers for sightseeing in Germany, featuring over 30 renowned museums and hundreds of respected art galleries. Dusseldorf: Known as Germany's fashion capital, Dusseldorf offers visitors a vibrant nightlife, a diverse culinary scene, and a range of shopping options. Brandenburg Gate: A defining symbol of Berlin since the 18th century, the impressive Brandenburg Gate also epitomizes European unity and continued peace. Pergamonmuseum: A standout among major German tourist attractions, the Pergamon Museum draws nearly two million annual visitors with its extensive collection of ancient Greek, Middle Eastern, and Islamic art. Memorial to the Murdered Jews of Europe: Both moving and controversial, the Memorial to the Murdered Jews of Europe is made up of an entire city block of concrete slabs and includes an underground museum that offers extensive details on the Holocaust and its victims. Reichstag Building: The country's center of political power, the Reichstag Building is also a major attraction in Germany, its glass dome offering sweeping views of the surrounding city. Berlin Wall Memorial: A powerful reminder of one of history's dark episodes, the Berlin Wall Memorial features the remains of several border installations and escape tunnels. Marienplatz: Centuries old and dominated by a Gothic city hall, Marienplatz features an iconic Marien column, built in the 17th century to mark the end of the Swedish occupation. Cologne Cathedral: World Heritage-listed Cologne Cathedral is one of the most popular stops on many tours of Germany, and is both an architectural masterpiece and a reminder of Christianity's strength in medieval Europe. Neuschwanstein Castle: Closely resembling a fairy-tale illustration, Neuschwanstein Castle stands perched on a mountain cliff and embodies the finest elements of an architectural trend known as "castle romanticism." English Garden: One of the biggest public parks in the world, English Garden covers an area of 370 hectares (910 acres) and includes a number of eye-catching temples, teahouses, pavilions, and pagodas. Topography of Terror: The chilling and thought-provoking Topography of Terror documents the fear tactics of the Nazi regime, offering sobering insights into the Gestapo and SS activities that kept much of Europe in a permanent state of horror between 1933 and 1945. Germany offers a varied selection of attractions sure to entertain both children and their parents. If you're looking for family vacation ideas in Germany, consider visiting Rust, where you can explore the popular Europa-Park, with over 100 attractions spread across 13 themed areas. To combine learning and fun, discover the diverse animal habitats of Zoo Berlin. A good option for families with teens, Munich's esteemed Deutsches Museum is one of the largest science and technology museums in the world, housing nearly 30,000 objects from the fields of tunnel construction, astronautics, bridge building, aerospace, and marine navigation. For a chance to see over 5,000 sea creatures from nearly 100 different species, visit AquaDom & SEA LIFE Berlin, noted for housing the largest cylindrical water tank in the world. One of the world's most popular destinations for family vacations, Germany boasts a lengthy list of kid-friendly attractions, including theme and water parks, museums, castles, and national parks. To create a memorable German holiday, consider hiking and cycling the picturesque forest trails of Baden-Wurttemberg or boating across sprawling Lake Constance (Bodensee). To add a history lesson to your itinerary, explore the museums of Munich or visit the lavish parks and palaces of World Heritage-listed Potsdam. For skiing, snowboarding, and sledding fun, head to one of the country's famed winter resorts, like Garmisch-Partenkirchen Ski Resort or Imberg / Skiarea Steibis. If your tour of Germany involves the entire family, try to create a diverse itinerary filled with both indoor and outdoor attractions. Combine visits to renowned museums with tours of legendary castles and palaces. Germany's big cities offer plenty of kid-friendly diversions like zoos, playgrounds, and pools, but don't miss the small towns and villages boasting atmospheric sites like Roman ruins and landmark churches. Germany features one of the world's most efficient road and rail networks, allowing visitors to travel between cities and across the countryside quickly and easily. Involve your children in planning your trip to Germany and keep a light and flexible schedule, with frequent stops at local restaurants where the entire family can recharge and enjoy regional delicacies. A traditional German dish usually consists of meat accompanied by potatoes and gravy, along with fresh vegetables or salad. Influenced by Italian and French flavors, modern German cuisine served in big-city restaurants increasingly consists of lighter dishes, often including various pastas and steamed vegetables. Germany's eating-out culture remains dominated by "gasthauses," best described as family-run eateries comparable to English pubs. Enhance your German vacation by visiting at least a few of these establishments, where you can sample tasty sausages served with local beers. If your itinerary includes Nuremberg, don't miss trying the popular "schaufele," a pork shoulder dish with mashed potatoes and plenty of gravy. While in Berlin, be sure to taste the famous pork meatballs, served in white sauce with potatoes or rice. While you can find plenty of modern shopping opportunities in all of Germany's big cities, small towns offer a more intimate experience at their family-run souvenir shops and open-air markets. If you time your trip to Germany for Christmas, don't miss the celebrated Lubecker Weihnachtsmarkt, held in the historical center of Lubeck and famed for its varied selection of handmade crafts. To pick up some edible gifts for the folks back home, look for quality German chocolates, often sold at discount prices by huge factory outlets like Lindt Werksverkauf in Aachen. Other edible souvenirs include smoked eel, sold in the country's coastal areas, and high-quality cheeses, produced in the Alpine regions of southern Germany. Archaeological evidence suggests humans occupied the territory encompassed by today's Germany as far back as 600,000 years ago. Germanic tribes spread across the area between the Nordic Bronze Age and the pre-Roman Iron Age, expanding south from Scandinavia and northern Germany. For a better understanding of this historical era, include the German Historical Museum on your itinerary. Roman conquests of Germania, an area between the Rhine River and the Ural Mountains, began with Emperor Augustus. Germanic tribes fought back, settling along the Rhine and the Danube and eventually taking over most of the land included in modern Germany. Germanic peoples then began breaking into the areas controlled by Rome, with the Franks and Saxons emerging as the largest of the Germanic tribes. To learn about the art and culture of Germany's early history, head to Germanisches Nationalmuseum. The histories of Germany and the Holy Roman Empire intertwined for over nine centuries. In 800 CE the Frankish king Charlemagne founded the Carolingian Empire, parts of which formed the basis of the Holy Roman Empire in the 9th century. This empire remained a major player on the European scene until the 19th century, when many German regions fell under the influence of France. Include Gemaldegalerie Alte Meister on your list of must-see tourist attractions in Germany to discover an extensive collection of art created between the 15th and 18th centuries. The Napoleonic wars gave rise to the idea of German unification. This process ended in 1871, with a number of previously independent German states coming together in a newly formed German Empire. This empire collapsed at the end of World War I, when Emperor Wilhelm II abdicated the throne and the short-lived Weimar Republic came into existence. Adolf Hitler rose to power during the 1920s and 1930s largely thanks to the young republic's economic problems. The Nazis seized power in 1933, quickly dismantling democratic institutions and forming a strict police state. Hitler's genocidal and territorial ambitions led to the start of World War II, which devastated much of Europe. Visit the Jüdisches Museum München and Topography of Terror to learn more about this period in European history. At the end of the war, Germany was split into four sections, controlled by French, British, Soviet, and American forces. The three western sections consolidated into a democratic nation, while the Soviet-controlled eastern zone remained a communist state. The two German republics united in 1990, after the communist regime of East Germany collapsed and the so-called "iron curtain" opened up. Today's Germany is an economic and political powerhouse, its thriving cities Europe's major hubs of transportation, art, fashion, music, education, and finance. If you're looking for modern places to visit in Germany, explore Alte Pinakothek and Porsche Museum. Germany remains a fairly formal society, but visitors can avoid most major social missteps by following a few simple rules. Make your holiday in Germany a more pleasant experience by learning some basic German phrases, which can help you politely ask for directions or help while sightseeing. Take a guidebook or phrase book everywhere you go, and remember to shake hands and salute strangers with a simple greeting, like "Guten Morgen" or "Guten Tag." Use first names only with friends and small children, and address people you meet for the first time as "Herr" or "Frau." Dress appropriately for the occasion, and remember to bring a small gift when attending dinners and parties at private homes. In addition to German Unity Day, celebrated nationally on October 3, each German state celebrates its own secular and religious public holidays. The biggest holidays include New Year's Day, Easter, Christmas, and Labor Day (May 1). When planning your trip to Germany, keep in mind that many Germans enjoy extended weekends around major holidays, especially if they fall on a Monday or Thursday. These long weekends usually mean heavy traffic on all the main roads, as well as big crowds at major airports and railway stations. The biggest festival in Germany is Munich's Oktoberfest, a 16-day gathering of beer enthusiasts running from late September to the first weekend in October. Much of Germany enjoys a temperate seasonal climate, moderated by the northern extension of the Gulf Stream. This warmer water affects the coastal areas bordering the North Sea, making them especially popular destinations for vacations in Germany. Winters in the northwest are relatively mild, while summers feature warm temperatures and plenty of precipitation. The eastern regions have a continental climate, with cold winters and hot summers. Central and southern regions offer varied weather conditions, with climates varying from oceanic to continental. A harsher mountain climate predictably dominates most of the country's Alpine regions, with lower temperatures and greater snowfall than in the rest of Germany. Thanks to an outstanding network of road and railway lines, Germany is one of the easiest countries to get around in Europe. You can plan your trip to Germany around any mode of transportation, but remember that the quickest ways to see the country's rural areas and smaller towns involve driving a private car or traveling by train. To explore villages and attractions located off the beaten path, take advantage of regional bus services, which fill in any gaps not covered by long-distance trains. If you choose to tour Germany by car, beware of sections of the Autobahn highway system without a speed limit, where you may see faster and more aggressive driving than you would see in your home country. German is the official language of Germany, though many people speak fluent English, French, Italian, or Spanish. Expect to hear different German dialects during your holiday in Germany, as most regions maintain their own particular way of speaking as an important element of local identity. For the sake of convenience, bring a phrase book on your trip, or practice a few basic German sentences before you head to a restaurant or theater. Most service staff in Germany receive hourly salaries, which makes tipping more a matter of politeness than necessity. Many fine restaurants charge a service fee, but most guests add a 5 to 10 percent tip to show their appreciation to waiters. Most bartenders and taxi drivers expect a small cash tip, as do hotel staff members like room cleaners and luggage attendants.